LeoVegas online casino is hosting an interesting Easter promotion for 2019, handing out a total of 500,000 free spins to their players. Every day of the promotional period, 18,000 free spins are distributed and can be played with selected slot games. Winnings from these free spins have no wagering requirements and are credited as real cash. How do I get the chance to win free spins? Any player who has made a deposit between the 1st of March and the end of the promotional period on the 12th of May will be qualified to participate. A total of 250 players will be randomly selected each day of the promotional period, and they can receive up to 100 free spins. The free spins can be played on a selected slot with a value of the minimum bet of the corresponding game. Winnings are free of wagering requirements and credited as cash. Also keep in mind the terms and conditions of the promotion, which you can see on the website. Also remember to set the Bonus Notifications to 'Yes' in your account settings, so that you can receive notifications. Keep in mind that not all players from every country are eligible to participate, but players from the UK, Germany and Canada can participate. Visit the website to find out if you are eligible to. General Bonus Terms Apply. 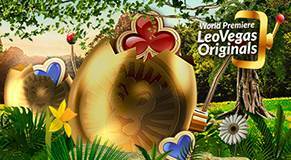 Take a Look at LeoVegas Online Casino! LeoVegas Online Casino is an established website with a fantastic game selection and a good player reputation. They are particularly famous for the large selection of mobile games and interesting promotions. You can find everything of importance about the casino, payment, bonus conditions, games and the loyalty program in our detailed LeoVegas review, or you can take look at our LeoVegas FAQ.